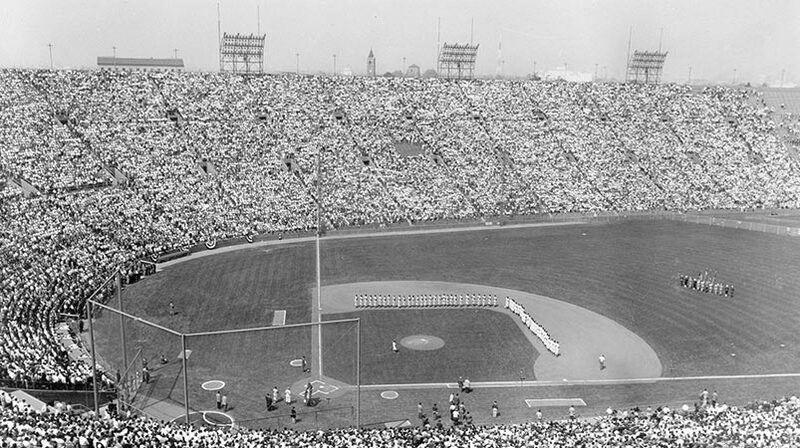 Under the purview of Director of Dodgertown Peter O’Malley, the Dodgers completed arrangements to purchase 110.4 acres of airport land, building and improvements for $133,087.50 from the city of Vero Beach, when final approval by the Federal Aviation Agency transpired on September 23, 1964. The agreement benefited the city’s general fund as the land would go on the tax rolls. The monies collected from the sale were to be “deposited in the Airport Fund for general aviation improvements and maintenance.” Three years prior, the city had guaranteed annual payments of $12,000 to the Airport Fund on behalf of the Dodger lease to satisfy the FAA which disagreed with the terms of the government’s original deed.William Jackson, Vero Beach Press-Journal, September 24, 1964 The city finalized arrangements for the Dodgers to become the only major league club in Florida to own their own spring training grounds on March 16, 1965, when O’Malley and Vice President and part-owner James Mulvey presented a check to Vero Mayor Jack D. Sturgis. In succeeding years, the Dodgers were successful in purchasing additional acres (some 340 more) of Vero Beach land to expand the base of operations. Careful maintenance and use of the land made the Dodgers popular friends of the surrounding Vero Beach community. Still faced with racial prejudice in the South, O’Malley had African-American players who were unable to play golf in their free time at one of Vero Beach’s two golf courses. In 1953, he had designed a pitch and putt golf course around the man-made lake with input from the players so that they could use it in spring, 1954. But with limited holes and space for that course, O’Malley decided to do what he felt was right — to build and maintain his own course, adjacent to Holman Stadium and the lake on the Dodgertown property. In 1965, he hired two minority coaches — African-American Jim Gilliam, a likeable former Dodger player and Preston Gomez of Cuban descent. The nine-hole course, named Dodgertown Golf Club, opened in 1965 and was available to the Dodger players, as well as the public. As an avid golfer himself, O’Malley could be found with Dodger players and executives on the links in his free time. To best aid his game, he personally oversaw the design of the course and the placement of its sand traps! Two of O’Malley’s top competitors on the links were his good friends Dr. Jim Priestley, the internationally renowned surgeon at Mayo Clinic and Jim Mulvey, part-owner of the Dodgers and President of Samuel Goldwyn Productions in Los Angeles. As the boss and with a twinkle in his eye, he could get a bunker placed overnight to discourage these opponents. O’Malley would take an early morning ride around the Dodgertown complex and say “Good Morning” to employees busily preparing for the business of the day. At each of the games, Kay O’Malley had her trusted official scorebook in which she kept score of every game. Seven years later, O’Malley expanded the golf interests of the Dodgers to include a piece of property adjacent to 43rd Avenue and 26th Street to an 18-hole course, called Safari Pines Country Club. The course featured a rare par-6 hole of nearly 667 yards. 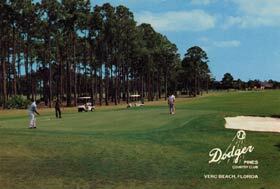 Subsequently, the name of the club was changed to Dodger Pines Country Club. In addition, 50 mobile homes were placed around the course, providing the Dodgers with a source of revenue to help offset the expenses of owning their own spring training camp. 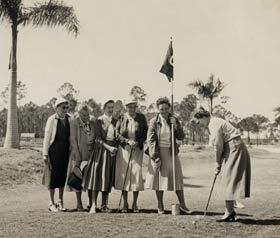 After baseball, one of Dodgertown’s most popular activities for players and executives alike was golf. 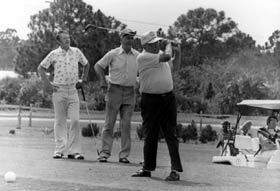 Walter O’Malley built two golf courses on the Dodgertown property (a nine-hole course in 1965 and an 18-hole course in 1972). 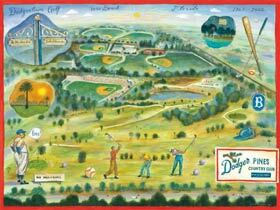 This John S. Dykes illustration celebrates the golfing fun at Dodgertown. A postcard of the Dodger Pines Country Club, which included a par-6, 667-yard hole designed by Walter O’Malley.Copyright © Los Angeles Dodgers, Inc. In 1953, Walter O’Malley designed a nine-hole pitch and putt golf course. Kay O’Malley, holding the flag, is joined by (l-r) Elizabeth Hickey, Edna Praeger, Evit Bavasi, May Smith and Lela Alston. Walter O’Malley takes a swing on the Dodger Pines Country Club course as Manager Walter Alston stands behind him with an unidentified man.